Be advised, this is not your grandfather's 1935 or 1948 film renditions of Anna Karenina. This isn't your sister's 1997 version either. None of the prior pursuits to bring Leo Tolstoy's epic to the big screen has had the imagination - or cojones - to attempt something this ambitious. If director Joe Wright fails to nab an Oscar nomination for his creation, the Academy should be disbarred. Filming his production as if it were taking place on a Broadway stage, Wright whisks set pieces in and out of frame, characters exiting stage left and reappearing stage right. It's dazzling, dizzying – a visionary masterpiece. It's not as if Wright hasn't tackled book-to-screen adaptations before, 2005's Pride & Prejudice was a beaut in its own right, but the translation was straight forward – conventional. This time around, it's anything but. 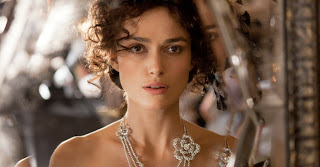 Keira Knightley is the titular Anna. With age, the now 27-year-old is glorious as the Russian aristocrat/socialite battling her heart's desire for a younger lover. Hitched to an older, balder senior statesman, Alexei Karenin (a suitably stoic Jude Law), Anna falls veil over boots for Count Vronsky (Aaron Taylor-Johnson), which doesn't sit so well with the snooty set, or yes, her hubby. You likely know the rest of the tale, Wright doesn't upend the 19th-century storyline. The Brit's bold reimagining of Tolstoy's tragedy is what makes this edition of Anna Karenina a cinematic event. Breaking down the walls - literally - Wright has served up a silver screen stunner.